In the last volume we learned that no one is safe. Now, after the staggering losses they've sustained, Rick and Carl are left to pick up the pieces and carry on, knowing that they could join their fallen friends and family at any moment. 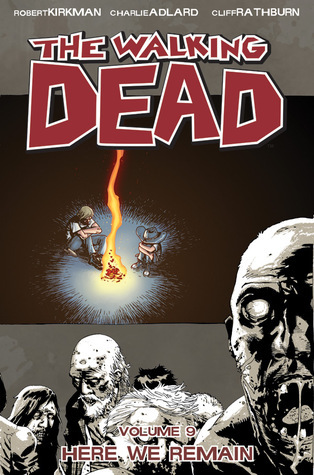 The ninth volume of The Walking Dead includes issues 49-54, and follows Rick and Carl as they escape the jail and try to find shelter. Things aren't going well for Rick and Carl, but when they find a house to hide in it seems like they might catch a break. Except, Rick gets sick and Carl is left to fend for himself for a while. Although he proves to himself that if push comes to shove he can survive on his own, Carl doesn't want to be alone. And neither does Rick really, because he goes a little nuts. I suppose it makes sense that he'd imagine Lori on the other end of a phone chatting to him. The trauma of losing her and Judy is still so new. Anyway, they eventually move on and run into a familiar face. Michonne is back and as awesome as ever with that sword of hers. They set out hoping to find Hershel's farm in a car they found, but instead someone finds them. Glenn and Maggie are actually staying at the farm with the others who got away--Andrea, Dale, the twins and Sophia. So the group is reunited. Until a trio of strangers appear at the farm with talk of herds. One of them claims he knows exactly how this mess with the zombies started. If only they can get to Washington DC.